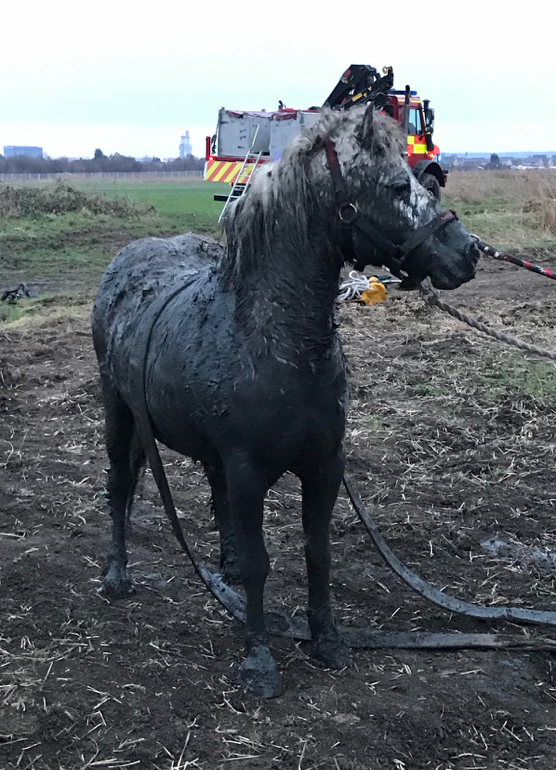 Essex Fire & Rescue Service and the RSPCA were called to a field off Marshfoot Road, Grays in Essex on Saturday afternoon (January 19) after a member of the public spotted the little grey pony at the bottom of a deep ditch. RSPCA inspector Caroline Richardson said: “It’s amazing that she was spotted as she was absolutely covered head to toe in mud and was neck-high in muddy water. You could just see her ears, the only part of her that was still grey. The little Welsh pony, who staff have named Puddles, had apparently been straying in the area for three months. Staff believe she’s around 15 and are appealing to find her owners. “I’d like to say a big thank you to the fire crew who did a great job retrieving her from the mud and, although she was a little stiff and terrified, incredibly she came out unharmed,” Caroline added. “She’s now having a well-deserved rest at the vets and will be cared for until we can trace her owners. For more information about rehoming a horse from the RSPCA please visit their website.